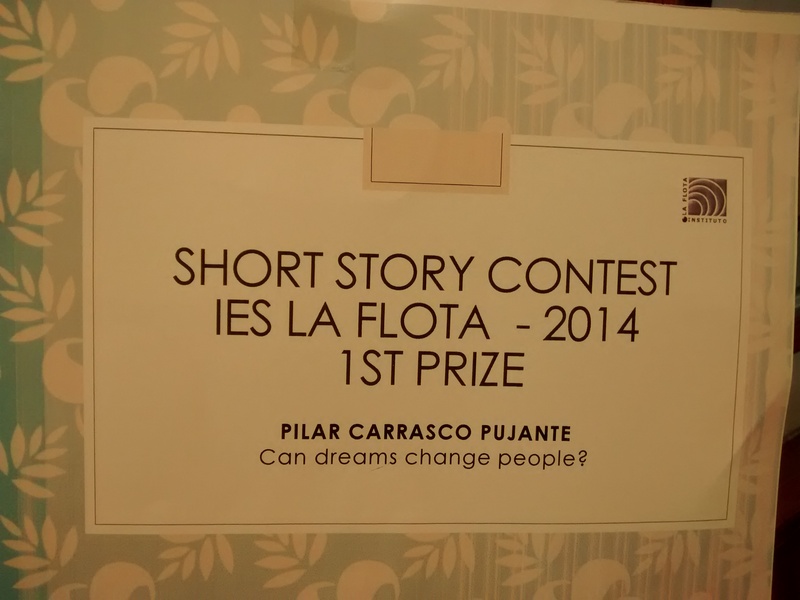 POR ESO Revista digital IES La Flota: Can dreams change people? I found myself in a completely darkness, I sat down on the floor looking for something inside my bag that could help me, but the only thing I felt was sand, everything had inexplicably disappeared. There was a huge queue behind us; Alison, Kate and I were the first ones in it and we didn´t want to wait a minute to live that incredible experience. The rules of the game were simple: take whatever we wanted and enter wherever we liked. There was only one condition, which I thought was quite strange and stupid: we wouldn´t know what the time was, there wouldn´t be any watches or mobile phones and we had to get to the end of the game before the gloaming. The place where we entered wasn´t similar to anything we had seen before: it was a huge subterranean cave whose entry had a wonderful spiral staircase. “Louise, let´s run until the rest of the group starts!” Alison said to me as she was going downstairs. We got to an enormous tunnel with sides in which there were thousands of galleries and we started searching in one of them; at its end there was a room full of mountain equipment and we took some big rucksacks, in order to keep all the things we planned to obtain, and some lanterns just in case we needed them inside the cave. The next gallery had a huge movie screen and lots of comfortable beds, Alison loved it, she was fascinated: “Oh my God!” She exclaimed, “It´s like a dream!” “Let´s lie on these fabulous beds and watch a film!” But Kate and I wanted to keep on looking in all the galleries, so we watched just one film and went out without Alison, since she refused to come with us. We got into a huge bookshop greater than any other in the world; stairs, corridors, lounges for reading, shelves… I had always loved reading and I saw books of every discipline there; philosophy, literature, science fiction…, so we started putting books into our bags, they were free! “Shall we sit down and read for a while?” I asked Kate “It is a paradise”. “We can´t waste a minute, we must keep on!” She answered at the time she started walking towards the entrance. I felt curiosity when we noticed that some of the galleries we passed by weren´t illuminated and I took my lantern in order to go into one of them. “I´ll wait for you here, Louise”, Kate said, “I´m afraid of darkness, you´ll be fine without me”. That gallery was different to the previous ones, as I walked I didn´t find anything at all so I finally decided to go back, but when I turned back I realised something was wrong: I couldn´t see anything, even the floor or my own feet. I checked my lantern but everything was ok; I didn´t know what to do, I felt confused and I started shouting even thought I knew I was too far away from anybody. All of a sudden, I was violently pushed on my back by something or someone and I fell to the ground. “Who is there? How can´t darkness be illuminated by light?” I thought. But those were questions I would never answer; the only thing I know is that after falling over I found myself at the tunnel again. “Nothing special in there, is it?” Kate said, “You´ve just entered and here you are again!” She smiled. I couldn´t utter a word, I would have sworn I had been in that spooky gallery for hours! “Are you ok?” She asked me worried. But she soon forgot about it since we heard voices from people who had arrived and were going into a gallery. We followed them. That gallery was one of those shops where you can find everything, from the smallest to the biggest thing, and everything was free, of course. Kate and I separated in order to explore and I started keeping everything I liked at fifty shelves at least. The conversation between two guys caught my attention; one of them was talking about one of the galleries he had visited: “I was the best warrior in the earth, man, no one could beat me!” I remember he said, “You could be whatever you wanted! You should go! all the guys are staying there!” They must have been talking about one of those boring videogames that are so famous at the moment. Suddenly, everything got silent and a voice from a megaphone announced the time was running out. Then it was when I remembered the condition and realised we couldn´t know when the sunset was, since we didn´t have sunlight into the cave. It was mad, hundreds of people running with huge rucksacks without knowing where they were going or how far they were from the end. “What happened if we didn´t get to the end?” I asked myself feeling worst every single minute it passed and I didn´t see the end. As the time passed, the lights that illuminated the tunnel were fading and they finally went out. I found myself in a completely darkness, I looked for my lantern in my bag, but there was nothing but sand there. Then is when I thought about all the time I had lost searching for the things that didn´t exist anymore and I realized I hadn´t even spent much time in those places that I had loved most, such as the library. It had all been about running in order to find and get more and more things, and now, I had nothing. We knew that a limited time had been given to us, and we had invested it in distractions instead of looking for the exit. Isn´t it funny how stupid people can be? How could possessions and fashion blind us to the point that we didn´t realize there was no way to see the sun? I closed my eyes and then… it ended.